Acclaimed as 'Britain's best drama' (Independent), Peaky Blinders is a crime family saga that takes the viewer on an epic journey from the lawless streets of post-war Birmingham to the heart of 1920s international intrigue. Thomas Shelby (Cillian Murphy - 28 Days Later, Inception) heads up one of Birmingham's most feared criminal organisations. But when he sees an opportunity to move up in the world, it becomes clear that his ambition k..
Cillian Murphy (Inception), Sam Neill (Jurassic Park) and Helen McCrory (Skyfall) lead a stellar cast in the acclaimed series from the writer of Eastern Promises that redefines the British gangster epic. Birmingham, 1919. The Shelby family lead the Peaky Blinders - a feared gang named for their practice of sewing razor blades into the peaks of their caps. Until now the Peaky Blinders have made money from illegal bookmaking, protection a..
Cillian Murphy (28 Days Later, Inception) ignites the screen as Thomas Shelby in Steve Knight's acclaimed British gangster epic, set in the years after the Great war. Featuring a spectacular cast that includes Sam Neill (Jurassic Park), Helen McCrory (Harry Potter And The Half-Blood Prince), Paul Anderson ('71), Annabelle Wallis (Annabelle), Charlotte Riley (Edge of Tomorrow), Noah Taylor (Game of Thrones) and Tom Hardy (The Dark Knight..
Own Peaky Blinders Series 1 to 3 DVD from Deff, DVD, Blu-Ray & 4K Video Specialists - Free UK Delivery.. The first four series of the BBC crime drama following the lives of a gangland family living in Birmingham in the early 1920s. Named after their practise of sewing razor blades into the peaks of their caps, the notorious 'Peaky Blinders' gang is one of the city's most feared, with interests in illegal betting, protection and the black market. 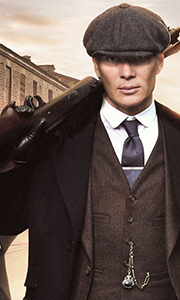 Former war hero and brains behind the operation Tommy Shelby (Cillian Murphy), however, is eage..
Own Peaky Blinders Series 1 to 4 DVD from Deff, DVD, Blu-Ray & 4K Video Specialists - Free UK Delivery..
Birmingham crime boss Thomas Shelby (Cillian Murphy, Inception) heads into perilous territory in the second series of Steven Knight's acclaimed gangster epic. As the 1920s begin to roar, business is booming for the Peaky Blinders, and Shelby starts to expand his criminal empire. But his rise brings him into contact with astonishing new characters who will test him to the very core. Featuring a spectacular cast that includes Sam Neill (..
Thomas Shelby (Cillian Murphy) is drawn into a maze of global intrigue in the blistering third series of the family saga that's being hailed as 'Britain's best drama' (Independent). Coerced into the most audacious crime of his career, Shelby faces overwhelming forces in every part of his life. His response to them will define the kind of man he is. Co-starring Helen McCrory (Skyfall), Paul Anderson (The Revenant), Paddy Considine (The B..
Own Peaky Blinders Series 3 DVD from Deff, DVD, Blu-Ray & 4K Video Specialists - Free UK Delivery..
Own Peaky Blinders Series 4 DVD from Deff, DVD, Blu-Ray & 4K Video Specialists - Free UK Delivery..
Own Peaky Blinders Series 1 to 2 DVD from Deff, DVD, Blu-Ray & 4K Video Specialists - Free UK Delivery..
Birmingham crime boss Thomas Shelby (Cillian Murphy, Inception) heads into perilous territory in the second series of Steven Knight’s acclaimed gangster epic. As the 1920s begin to roar, business is booming for the Peaky Blinders, and Shelby starts to expand his criminal empire. But rise brings him into contact with astonishing new charcters who will test him to the very core. Featuring a spectacular cast that includes Sam Neill (Jurass.. When Tommy Shelby (Cillian Murphy, Dunkirk) receives a mysterious letter on Christmas Eve, he realises that his entire family is in danger of annihilation. As the enemy closes in, Tommy flees his country house and heads to the only safe place he knows… Co-starring Helen McCrory (Skyfall), Paul Anderson (The Revenant), Aidan Gillen (Game of Thrones), Adrien Brody (The Grand Budapest Hotel) and Tom Hardy (Mad Max: Fury Road), Steven Knig..